This top depicts the dance of the heavenly maiden, a story connected to Japan’s version of the swan maiden folklore. Variations on this story typically include a beautiful young woman spotted bathing in the woods by a male hero. While she bathes, he steals her feathered robe (or an article of clothing) from where it hangs on a tree branch, which prevents her from changing back into her magical bird form to escape. He then forces her to become his wife. Hiroi-sensei has created a top that mimics the heavenly maiden dancing at the top of a mountain as she descends from the sky. Made up of two different tops, this set is particularly difficult to spin. First you must spin the bottom half (the mountain), then carefully balance the second top on the very tip of the first, so that it begins to rotate from the force of the lower half. 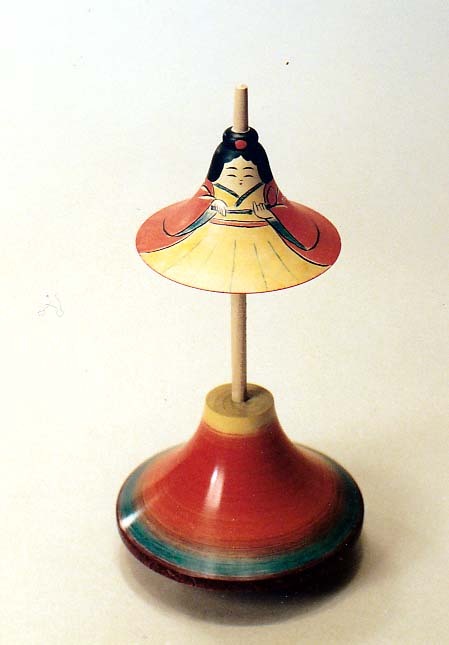 Balanced properly, the maiden appears to be dancing as she rotates in opposition to the mountain’s spin. Hiroi Michiaki:　And this is, ah—this is the heavenly maiden’s dance. Mrs. Hiroi: The heavenly maiden’s dance. MH: Some kind of pine forest. HM: There, long ago the heavenly maiden came down [from the sky] dancing, and she hung her feather robe in the pines… and a young hunter or someone takes it, and even though the heavenly maiden asked him to return it, he didn’t, I suppose. Somehow or another there are other things [that happen] and many interesting stories there. It’s a top modeled on that [story]. As it turns it looks like the heavenly maiden teetering around [dancing] on top of the mountain. Janell Landis: Th-That [one], spinning it is hard. HM: (laughs)　It’s kind of hard, yeah. MH: Mmm… it doesn’t spin easily. Paula Curtis: You thought it was Kaguya-hime. JL: When I was gone away. I-I used it in connection with her. Yeah. HM: Yeah, it’s a similar story. Was it called the “Heavenly Feather Robe”? Mm.